As promised...here are the pictures of our donation that hung across the Mississippi River in promotion of Breast Cancer Awareness. Over 3,000 bras were donated and that adds up to a whole lot of cash since the River Walk Hotel and Casino gave a dollar for each donation. Even though this event focused on women's health, please don't forget that 1% of men will be diagnosed with breast cancer as well. 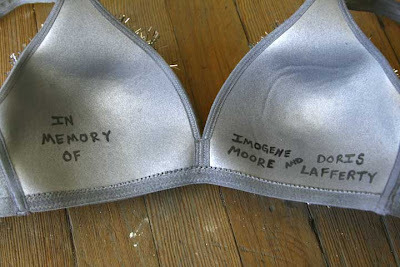 I love what you did with your bra! I'm sure the ladies it was in memory of would have loved it, too.